Move into comfort and convenience at Falls Creek Apartments & Townhomes. One, two, and three bedroom floor plans for rent offer generous space and classic finishes. Choose from one bedroom apartments sized at 788 or 954 square feet, or a two-bedroom apartment at 1,044 square feet. Two bedroom townhomes span 1,205 square feet, while a three bedroom townhome measures an expansive 1,366 square feet. All layouts meet high Morgan Property standards for seamless function and clean, classic style. Come home to classic style and generous living spaces, designed for your everyday comfort. Central air conditioning keeps it cool for you and your pet. You’ll stay connected with available high-speed internet. 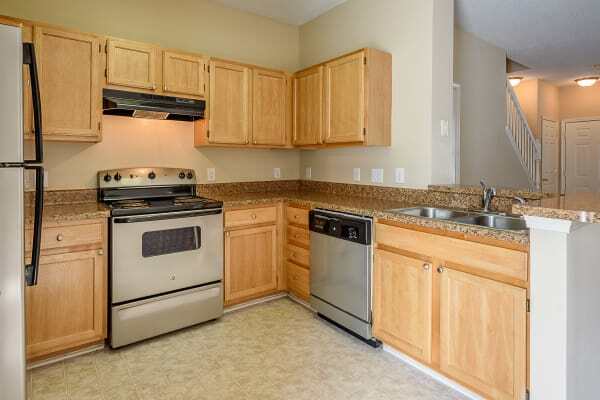 Modern kitchens include a convenient dishwasher and a refrigerator with ice maker. Your private balcony or patio opens up your world to the great outdoors. Please visit our Amenities page for a full list of apartment features. Select the best with a Morgan Property apartment or townhome at Falls Creek. Schedule your personal tour with our leasing office today.